RIDE TIME: Jackson, Mississippi’s regulations on taxis are some of the most restrictive in the state. Price might be a reason why Waller’s business, protected by the state’s most restrictive taxi ordinance, is struggling. Mississippi Watchdog paid for a ride to the Jackson-Medgar Wiley Evers International Airport from the state Capitol on Uber, a distance of 13.73 miles. The ride cost $19.25. Taking a taxi from one of the city’s five licensed operators, Jackson Taxi, back from the airport to the Capitol 30 minutes later using the same route cost $43.50, an increase of 125 percent. One caveat: Jackson’s taxi industry prices are controlled by a price ceiling imposed by city ordinance. A Jackson taxi passenger can be charged $3 for the first one-tenth of a mile and $3 for each additional mile. There is no floor on pricing in the ordinance. 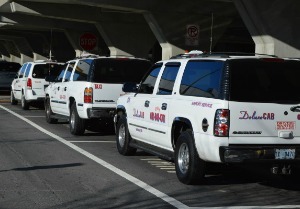 Calls to two other Jackson cab companies, Veterans Cab and Deluxe, found that a similar ride would cost $40 to $45 for the former and $35 to $40 for the latter. Sign-up for our Nanny State of the Week email list to receive the latest news and in-depth coverage. Uber employs what is known as “dynamic pricing” where fares are increased when there are more riders than drivers available. The company says this pricing model affects only 10 percent of fares and is used during Friday and Saturday nights, on high-traffic holidays such as Halloween and New Year’s Eve and during big events and bad weather conditions. The taxi industry has resisted efforts to reform Jackson’s taxi ordinance, which requires that cab companies have a garage in Jackson with an operator available 24 hours to answer service calls. A cab company owner applying for a permit to operate in Jackson must have at least eight cabs, with half of them garaged within the city limits, and be approved by the Transportation Permit and Review Committee that has one representative each from the city’s taxi and limousine companies. Also, the ordinance bans cabs from carrying outside advertisements and requires a dress code for drivers. The regulations have already drawn a lawsuit from a pair of taxi drivers — John Davis and Shad Denson — who say their attempts to set up their own cab companies were stymied by the ordinance. The lawsuit was filed in March in Hinds County Chancery Court by the Mississippi Justice Institute and the last hearing was several weeks ago. Their attorney and Mississippi Justice Institute director Mike Hurst told Mississippi Watchdog they are still awaiting the judge’s decision on a pair of motions by the city. The first would dismiss the drivers’ request for summary judgement and the second would halt the discovery process in the case. As you know, MS Center for Public Policy and MS Justice Institute continue to pound away at the taxi cartel which Jackson keeps in place, but it is my understanding that a favorable ruling by a Chancery Judge has pushed the issue along to the Court of appeals, I believe. This has been one of the landmark cases instituted by MJI. I am not up to date on the issue.